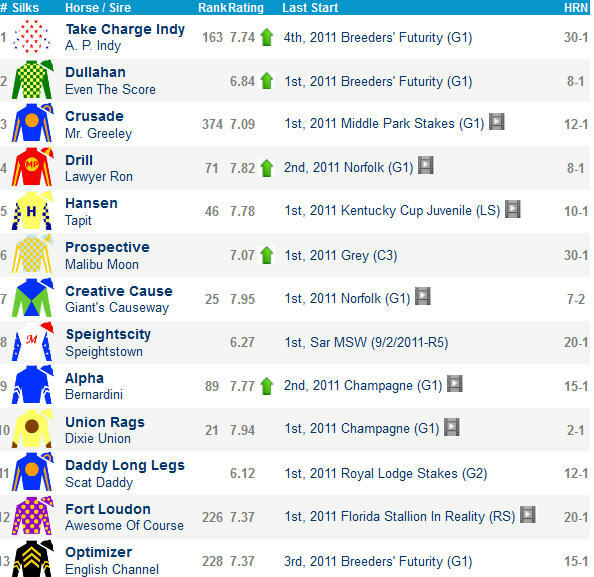 Florida Derby 2012 Preview: Can El Padrino Beat Union Rags? The final major Kentucky Derby 2012 prep at Gulfstream Park will be held March 31 and Union Rags is the strong 6-5 favorite in the Grade 1 Florida Derby. #6 Union Rags (6-5) has been part of my Derby Top 10 since I started the list last September, and he has occupied my top spot since last November. The uncrowned juvenile champ looked great in his facile G2 Fountain of Youth return but there was not much behind him that day. 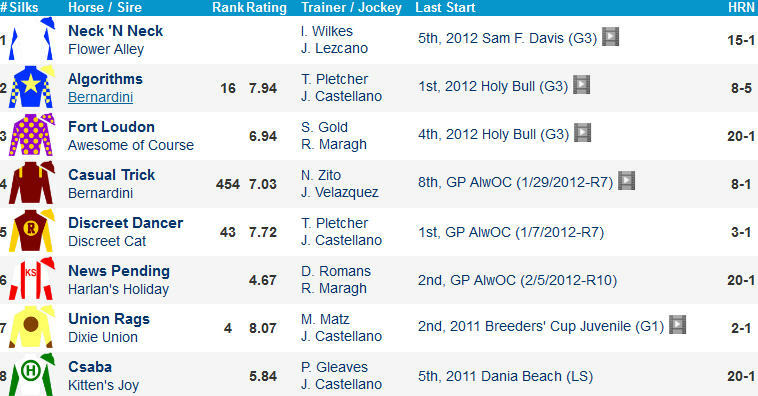 He has over $1 million in graded earnings and figures to be no worse than 2nd in his final Derby prep. #8 El Padrino (2-1) might have the tactical edge in here since he drew outside of heavy favorite and fellow stalker Union Rags. Castellano might park him on the flank of the aforementioned fav and bide his time. The G2 Risen Star hero owns the best numbers, has been battle tested, and smartly scored here in January. Should be an interesting chess match between Castellano and Leparoux, and remember that the former gave up the mount on Union Rags earlier this year! #1 Fort Loudon (20-1) has some tactical speed in a race that came up light on pace and might try to take advantage of the inside post. He showed some ability as a juvenile but has struggled against better graded company in his last three. Jurado rides him well and a minor award is not impossible. #4 Neck ‘N Neck (20-1) had some early trouble (bumped, steadied) in the FOY (blinkers on). He failed to seriously threaten graded rivals in his last pair but his numbers are on the rise. He has earned triple digit Late Pace Ratings in his last three and should enjoy this longer trip. Edgar Prado rides. I have always liked #3 Take Charge Indy (5-1) but he has been curiously handled this year. He began his campaign with a clear place finish behind El Padrino but scratched out of the G2 Tampa Bay Derby when he drew post 10. He has not been seen since Jan 29 and has only shows four published times since. He owns dangerous speed but has lost stretch ground in his last four and might fold his tent when Union Rags and El Padrino come running. #9 Reveron (12-1) has fired Trifecta shots in all six starts including a win in the local GP Derby and a show finish in the G3 Sam Davis. The fresh colt removes the hood and is firing Calder bullets for this but is stuck in the outside post and seems a cut below. #2 News Pending (8-1) received a smart ride in his FOY place finish. Kent D sensed the slow splits and wisely moved early, but he was no match for Union Rags. His numbers are going the right way but he is 0-for-4 on dirt. He reunites with winning rider Rajiv Maragh and figures to stalk the pace for trainer Dale Romans. #8 Bartolome (30-1) exits a solid show finish in a course/distance Optional Claiming affair. He faltered badly against El Padrino and Take Charge Indy before that and seems up against it. #5 Z Camelot (50-1) is a well-bred maiden facing graded company for Dale Romans. The $550k Keeneland sales grad set the pace and weakened to 5th when last seen in a 9f MSW turf route here Feb 23. He is over his head to say the least. Juvenile champ Hansen begins his quest for Kentucky Derby 2012 in the G3 Holy Bull Stakes at Gulfstream Park on Sunday and he is the 6-5 morning line favorite in the one mile test. Hansen has never been headed in three lifetime starts and is the one to catch in the Holy Bull (10th race) but I have never been a huge fan of the undefeated colt. The Mike Maker trainee easily captured his first two synthetic starts at Turfway Park and caught a funny drying out track in the G1 BC Juvenile. He controlled the pace under the Twin Spires and was fortunate to just last over Union Rags, who failed to keep a straight course in the lane. The speedy son of Tapit has only worked five times for this engagement. His first four furlong drill was timed in a slow :53 so he probably did not get much out of that one, and he went fast early and got tired late in latest five furlong move. He makes his first start since early November and does not have to win this at low odds. Ramon Dominguez rides. Consortium is an interesting contender for Kiaran McLaughlin. The promising son of Bernardini, out of Machiavellian mare Marietta, is bred to run all day. He looked great rallying in his Big A Bow and did all of the pace dirty work in a better than appears place finish behind today’s rival Algorithms in a Gulfstream optional claiming sprint Dec 16. He adds first lasix and there is other speed in here this time, so look for Johnny V to employ patient tactics. Algorithms sat the perfect outside tactical trip against Consortium last time and it could be deju vu all over again. The Todd Pletcher trainee is also out of hot sire Bernardini and he sports a Palm Meadows bullet for this. Castellano is enjoying a fine meet and he looms large as the 5-2 second choice on the line. Fort Loudon was last seen finishing 7th in the BC Juvenile from post 12. He raced eight times as a juvenile and all of his wins and works were recorded at Calder. He will likely press the pace under Maragh. Silver Max goes turf/dirt for Dale Romans. He has fired Exacta shots in all six lifetime starts and finally earned his diploma in a local flat mile turf affair Jan 13. He likes to show speed and should be hustled away from the rail under Leparoux. My Adonis dueled through strong splits before spitting the bit in a weak renewal of the G3 Delta Jackpot. The Kelly Breen trainee is shooting bullets for this but will have to deal with serious pace rival Hansen early and often. Earlier on the Gulfstream Park program, a trio of promising 3-year-olds will hook up in an allowance route (7th race), and El Padrinolooms the value play at 4-1. El Padrino was originally slated to go in the G3 Lecomte at Fair Grounds last weekend, but trainer Todd Pletcher felt he needed another work and his latest five furlong morning move was accomplished in 1:02 and change at Palm Meadows on Jan 23. I love his distance oriented pedigree (Pulpit-Giant’s Causeway) and early-pressing types from inner posts perform well in 8.5 furlong races at the Gulf. Look for the G2 Remsen show finisher to track the pace under new rider Castellano. Take Charge Indy, the 5th place finisher in the BC Juvenile, is another with strong distance breeding (A.P. Indy). He has only worked four times for this but did fire a Palm Meadows bullet on Jan 24 and should stalk the pace under Borel. Finally, Casual Trick is the one to beat as the 5-2 morning line favorite. Nick Zito’s charge exits a solid place finish in the Gulfstream Park Derby and owns a recency edge over his aforementioned rivals. He is yet another promising runner out of Bernardini, and this entry level route could top the Holy Bull in terms of producing Kentucky Derby contenders.